Looking For Professional Tree Trimming in Northern Virginia? Do You Need Help With Pruning Trees? Our Tree Pruning Experts Can Ensure The Health Of Your Trees. Trees living in the urban environment need to be pruned from time to time. Reasons for tree trimming services can range from the removal of dead or diseased branches; to cutting back limbs from a building, sidewalk or light; vista pruning; or simply to maintain the shape and structure of a tree. No matter what the reason, the decision to consult in a professional tree trimming service must bear in mind the consequence it will have on the structure, health, and vigor of the tree which can be done by our certified arborists. Whatever your reason for tree pruning, there are some general guidelines that should be followed. Chief among these are to never prune more than 25 percent of the foliage from a tree during one growing season. Keep in mind good branch structure when selecting which branches to prune. And remember, topping is an outdated practice that harms tree health and increases the risk of tree failure. Both the International Society of Arboriculture and the Tree Care Industry Association strongly recommend against tree topping. Tree pruning must be done correctly in order for the wound to properly heal. The cambium layer on your tree’s surface produces cells that close over wounds and flush cuts remove this cambium layer. Alternatively, stub cuts can also leave too much wood exposed. 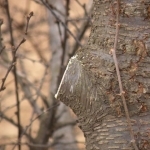 Both of these conditions result in wounds that don’t cl ose over, which may allow decay to develop or the perfect environment for insects and pests to make home inside your trees. When having tree pruning services done to your tree, make sure the tree cutter is a certified arborist. Proper tree trimming services, performed by your Virginia certified arborists at Growing Earth, can help maintain healthy trees. To reduce the need for maintenance pruning, a tree growth regulator may be a good solution on a case by case scenario. Maintenance tree pruning can also be spaced out further with the proper use of plant growth regulators, but it can’t be used in all situations. 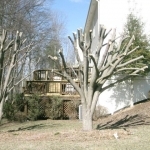 If you live in the northern Virginia area, you know that the team of certified arborists at Growing Earth Tree Care are the tree experts you can count on for tree trimming services. Contact us today to discuss our services!